Tensions continue to rise in Venezuela, where a defenseless population stripped of its right to bear arms is facing the heavy hand of a socialist government hellbent on eradicating freedom. Reports indicate that demonstrators throughout the destabilized country are now being assaulted by government military vehicles simply for making their voices heard, and that in some cases tank-like armored cars are plowing into crowds of people, injuring and killing them. In just one day, more than 300 people were reported injured, and one dead, after clashes between protesters and state police escalated into full-blown violence. 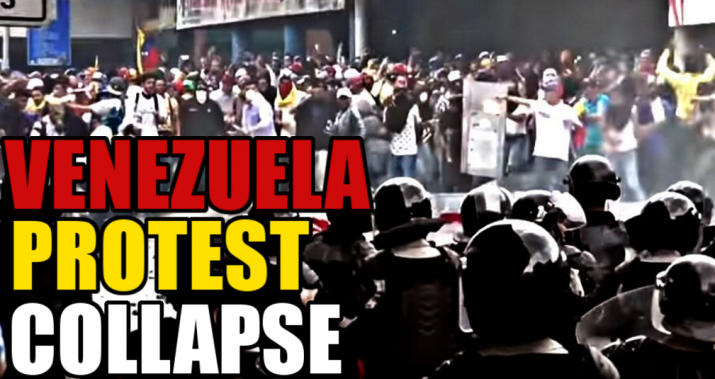 Venezuela’s El Nacional newspaper published a series of video clips highlighting one incident in particular in which an armored vehicle drove straight into protesters congregated on the street – this after a “firebomb” was reportedly thrown, setting the scene on fire. The Wall Street Journal published its own video as well, highlighting the incident from multiple angles captured on individuals’ mobile phones. Protesters, many in masks and bandanas, can be seen trashing a motorcycle as the armored vehicle approaches them, running over several of them as it continues to make its way through the streets. All of this turmoil stems from public opposition to Venezuelan President Nicolas Maduro and his continued abuses of power, including his recent announcement that he intends to rewrite his country’s constitution to consolidate more power for himself. According to Bloomberg, hundreds of thousands of people have taken to the streets in recent weeks to oppose Maduro’s actions, which threaten to bring Venezuela even further into the depths of autocratic authoritarianism. Since the start of the protests, at least 30 people, including several politicians opposed to Maduro’s power grab, have been confirmed dead after getting caught in the fray of protest violence. And all the while, Maduro couldn’t care less about this continued loss of life, nor has he shown any interest in quelling the unrest that is ravaging his country. Instead, a video posted to Twitter shows Maduro dancing it up on state television as protests take place in the streets below. “Maduro is so disconnected and divorced from the country’s reality that he was having a good time dancing while he ordered Venezuelans murdered,” the opposing coalition to Maduro’s reign of terror announced in a response to the disturbing footage, which was also posted to Twitter. One of the more tragic examples of the fallout from these protests was the recent fatality of a 17-year-old young man who was reportedly struck in the neck by an unknown object during a bout of violent protests. The young man’s death brought the official death toll to 34, according to Breitbart, reiterating the severity of this resistance movement. Follow more news about civil disobedience at MartialLaw.news.